Las Vegas is a hedonistic paradise, full of wonderful sights and sounds to enthrall all visitors, young and old, male or female. There are many things to see and do in Sin City, and dozens of world-famous hotels, casinos, and night clubs. What many people do not know, however, is that there are also plenty of hidden gems on offer as well that are equally entertaining. One prime example of this would be professional bull riding in Las Vegas, something which would appeal to all the family. Each year the fiercest bulls in the world are transported to Vegas, ready to enthrall and entertain the gathering masses by putting on a fantastic show. At the Thomas and Mack Center you will find huge crowds coming together for the Professional Bull Riding (PBR) finals, an event which completes the season and brings together the top riders in the world. With so many points available at the final event, any of the top ten riders may well be in position to claim the grand prize. In these events, the bulls are just as important as those riding them. Often, in fact, it is common to find people closely following the careers of the bulls, rather than the riders themselves. Proving this point is the fact that there is also a bulls' competition each year, along with the riders' competition, where contractors can win up to $15,000. The prizes available to the participants are certainly not insignificant. Throughout the season, the riders work hard to amass as many points as possible leading into the final events. When it comes to the PBR finals there is a grand prize of $1 million up for grabs. If you plan on coming to the finals, it is important for you to plan your trip well in advance. Its a fairly significant event on the calender and, as such, a lot of the hotels and alternative accommodation in Las Vegas will be booked up pretty quickly. To avoid missing out, you should therefore start looking into hotel bookings early. There are six rounds in the competition itself. Each of the riders who have managed to make it to this stage will then compete in five of these rounds. After these five rounds have been completed the total points for each rider will be tallied up before the top 15 are chosen to progress into the final round of competition. 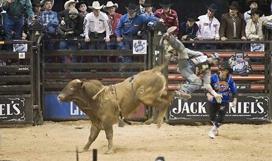 Bull riding is certainly a fun and exciting sport to watch and is generally good entertainment for all the family. If you, or anyone in your family is of a nervous disposition, or if you have young children, you may want to be slightly more careful, as injuries can occur. In general, however, the entire event is a great day out regardless of who you are with. Vegas Tickets.com offers premium tickets to the 2012 PBR - Professional Bull Riders at the Thomas & Mack Center in Las Vegas. Tickets can be ordered online through our Safe and Secure website, or by calling one of our professional representatives toll free at (877)-467-4697.